1-million bracelets sold and $1-million raised for malaria elimination initiatives. We can show the world that Africa can solve its own problems without a “begging bowl mentality” – and that we have a creative, African solution to one of Africa’s biggest problems, malaria. Meet Goodbye Malaria, a social benefit organisation that brings energy, passion, creativity and world-class partners to priority programmes in Mozambique. One of those world-class partners is Relate Bracelets. 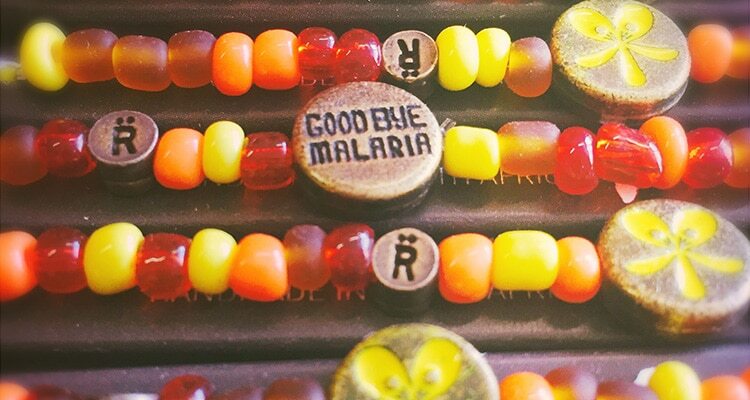 Goodbye Malaria has recently sold its 1-millionth Relate bracelet – meaning a total of $1million was raised directly to malaria elimination initiatives, whilst empowering South African communities through Relate’s enterprise development initiatives and employment of previously disadvantaged persons. A portion of funds from every bracelet sold around the world is also designated for enterprise development initiatives in South Africa. As co-founder of Nando’s, Robbie has helped shape the way people think about chicken, and did it while having fun and making money (not the other way around). After stepping down as group CEO of Nando’s in 2011, Robbie had the space to be creative and keep things relevant, exciting, and give purpose to the business. Today Robbie’s personal reinvention involves focusing his creative energy on a new vision: to eliminate malaria in Mozambique by 2030, while changing the way the world thinks of Africa. At this stage two important questions need to be answered; Why Mozambique, and Why Malaria Merchandising? Eliminating malaria in Southern Mozambique, where Goodbye Malaria’s Indoor Residual Spray (IRS) programme is underway, means we’re getting significantly closer to the elimination of malaria in neighbouring countries like Swaziland and South Africa. It’s a strategic area to tackle if we want to make the elimination of malaria in Southern Africa a reality. Goodbye Malaria has added colour and flair in the development of its merchandising that aims to create awareness among consumers, raise funds and develop skills and empowers communities. Goodbye Malaria’s merchandising sales have increased by 58% year-on-year in 2016/7, and sold online via www.goodbyemalaria.com or in-stores. Each product has an inspiring story of the crafter who hand-made it and the local business who employs and empowers them. Relate Bracelets, a 100% not-for-profit social enterprise, provides senior citizens with meaningful employment, hand-beading Goodbye Malaria’s colourful bracelets. The gogos are remunerated for their work, affording them the opportunity to support their families and AIDS-orphaned grandchildren with dignity. Fun and colourful pyjama pants are made from Goodbye Malaria’s super-soft, 100% cotton shweshwe print fabric – featuring the symbolic Citronella inspired logo cleverly incorporated into the iconic African print. The concept, Save a Life in your Sleep, connects socially conscious shoppers with a pair of pants they can wear, knowing they are contributing towards developing South African creative communities, while joining the fight to eliminate malaria in Mozambique. Goodbye Malaria’s unisex pyjama style pants are available in two fits (slim or regular) and available in five afrocentric colours. No Mashozi teddy is alike. Upskilled township women from Cape Town lovingly create a different part of the teddy’s body, hand embroidering appliqued hearts and stitching to tell a story for those who take the time to look at the beautiful details. Buying a teddy allows a mother and child in Mozambique to sleep a little easier, knowing they are protected from malaria. Innovative and accessible to consumers, Goodbye Malaria’s merchandising programme gives consumers the opportunity to get involved. With your help we can be the generation to end malaria in Southern Africa for GOOD, while changing the way the world thinks of Africa. This article was first published by Spice4Life on 25 April 2017.